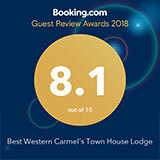 Making your Carmel hotel reservation is as easy as our way of life in Central California, and at the Best Western Carmel's Town House Lodge we make it even easier with a team that's ready to help you plan your next trip. When you feel like hitting the links, relaxing at the spa or whale watching on the bay, our Carmel hotel has a vacation package with your name on it. Please contact us by phone, fax and email, or use our convenient online booking. We can't wait to welcome you to Carmel.